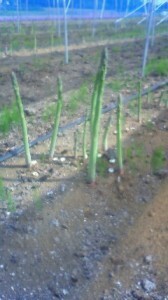 TsukuBlog | There are asparagus, and then there are ASPARAGUS- like those on Ryuichi Someya`s farm ! They are IN SEASON now! As a child growing up in New York, I never could have imagined that I would be enjoying asparagus THIS MUCH. You see, my earliest encounters with the vegetable were not very favorable. Back then we would have them exclusively OUT OF THE CAN, and the pale, limp and soggy stalks looked like boiled snakes to me and eating them tasted not very much different from chewing on water-soaked paper. Oddly, it was only after coming to Japan, where vegetables are almost as a rule served fresh and IN SEASON, that I started to appreciate this traditional( and quite ancient) European food. Since Ive been living here, whenever May has rolled around ( that is the month in which asparagus are considered SHUN ( 旬), at their best), I have been treated to freshly harvested aparagus prepared and served in a variety of ways- though most commonly grilled or steamed- at restaurants and at friends homes. No matter how much I had grown to enjoy asparagus, nothing could have prepared me for what happened this year, when my student Asako-San presented me with a gift- a surprisingly heavy bundle- which she said was from her brother`s farm which was located right here in Tsukuba. 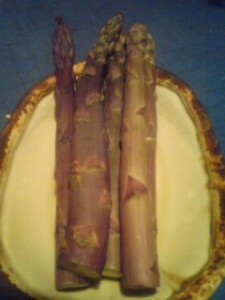 Back home I opened my package only to find the most impressive looking asparagus I had ever seen- and PURPLE, to boot! 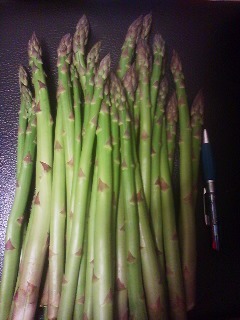 An asparagus from the Someya Farm- steamed and ready to eat! After steaming them carefully, they looked surprisingly impressive laid out in the serving dish. Their taste, deeply flavorful, was even more eye-opening. In fact, I went on an asparagus eating rampage, munching down all the stalks I had cooked up in one sitting! The next time I met Asako-San ( she had actually brought some more asaparagus for me! ), I asked her if she could take me to her brothers farm, so I could have a look. She gave him a call- and the rest is history. The Someya Asparagus Farm is located in the Hakke ( 百家) district of Tsukuba, an area of big, old traditional houses and agricultural fields. Driving through its narrow lanes can seem like entering another world to those who only know the newly developed parts of our city. Someya-San, looking much younger than he actually is- 62, came out to greet us and give us a tour of his asparagus farm- one of only a handful in the Tsukuba area. Though famous as a crop of Hokkaido ( Japan`s northern-most island), in Ibaraki, it is also grown in the northern and eastern parts of the prefecture ( which is our prefecture). 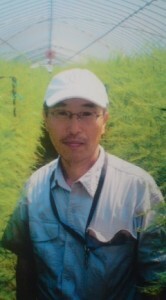 I was amazed to learn that Someya-San had just recently become a professional farmer, having long dreamed of doing so after retiring from a career in the civil service. As he approached the age of 60 ( the retirement age), he scoured agricultural textbooks, and pondered what his special crop would be. He ended up settling on asparagus. Three years of incessant labor (and lots of heart) have produced delicious results, and customers have claimed ( myself among them) that his asparagus are the best they have ever tasted. The tour of the farm itself also turned out to be an eye-opener, as I found that asparagus were not unlike bamboo shoots ( though completely unrelated), in that they were harvested as young sprouts, before leaves appeared, and if left alone grew into large trees. The insides of Someya-San`s green-houses looked like bamboo forests! The best season for asparagus is right now. He will be harvesting every day through October. If you visit the farm during this period you will be able to pick your own to take home or send as gifts. 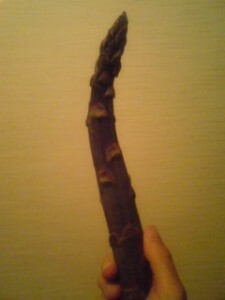 These asparagus have many fans who come or order from far and wide ( even after this year`s earthquake and nuclear accident). And if you are not up to picking them yourself, you can just buy some, the plain old way. Enjoy the fruits of this labor of love.